PRESS RELEASE - To celebrate four decades of designing and building some of the world's most beloved acoustic instruments, one might not expect Taylor Guitars to "go back to the drawing board" on its flagship guitar series. But that's exactly what Bob Taylor and master luthier Andy Powers have done with the company's iconic rosewood/spruce 800 Series, which Taylor is excited to reintroduce at the 2014 Winter NAMM Show. "Our intent with the redesign of the 800 Series is to bring the highest quality sound to the forefront and make everything in the guitar's design work to serve that goal," notes Taylor cofounder and namesake Bob Taylor. "Andy's got an incredible knack for knowing exactly what to change to bring out a certain tonal nuance. He's like the guitar-making equivalent of a brilliant mathematician." Powers' first full-fledged, from-the-ground-up design project as part of the Taylor team was the Grand Orchestra, which was released a year ago to replace the Jumbo and earned immediate accolades from players, dealers and guitar reviewers. This time around, Andy and Bob have put nearly every material component of Taylor's 800 Series instruments under the microscope in a quest to create a more inspiring, musical playing experience. Bracing: Drawing extensively from the same ideas that informed Powers' bracing scheme for Taylor's Grand Orchestra body shape, each of the new 800 Series models features a unique new bracing design to bring out greater warmth, midrange, balance and sustain. Protein Glues: A subtle refinement that was coupled with the new bracing schemes is the use of protein glues, long associated with centuries of musical instruments before the development of man-made woodworking glues in the 20th century. With the new braces providing an energy transmission network for the top and back of the guitars, these instrument-friendly protein adhesives facilitate their movement in a different way, enhancing clarity and volume. Finish Thickness: Because of the tonal benefits associated with thinner finishes, Taylor used its cutting-edge manufacturing expertise to reduce the thickness of its polyester gloss, ultraviolet light-cured finish to an average of 3.5 mils or less-nearly half the thickness of its standard gloss finish-while still preserving a beautiful luster. This difficult-to-achieve reduction has helped make the guitars louder and more responsive. Wood Thickness: Another subtle recalibration is in the top and back thickness specification for each model. Optimized dimensions help bring out the best of each body shape. String Gauge: Powers worked in tandem with engineers at Elixir® Strings to create a new string set package known as HD Light, featuring customized string gauges. This set brings a bolder, stronger high end and fuller, warmer low end specifically to the Grand Concert 812(ce) and Grand Auditorium 814(ce) instruments. Furthermore, Taylor has now switched the rest of the 800 Series line, as well as all of its other steel-string models, from 80/20 Bronze to Elixir Acoustic Phosphor Bronze Strings with NANOWEB® Coating for more high-end sparkle and overall warmth. Pickup:Beyond the acoustic voicing enhancements already mentioned, the new 800 Series acoustic-electric models feature Taylor's new Expression System® 2 (ES2), which incorporates three uniquely positioned and individually calibrated pickup sensors. These are installed behind the saddle, through the bridge, and effectively capture more of each guitar's dynamic properties and acoustic energy. Aesthetic Package: Last but not least, the new 800 Series models boast a handsomely updated look via a refreshed appointment package featuring new binding and purfling, fretboard inlays, rosette and backstrip, along with a rosewood pickguard and marbled ebony fretboards. Andy Powers points out that the ability to implement such a sweeping array of design improvements is a testament to Taylor's manufacturing sophistication. "These are refinements that a luthier normally would only be able to bring to the highest quality concert guitar - a guitar built by one person with skilled hands from start to finish, because that one person would need utmost control over every aspect of the instrument," he says. "But the consistency of our manufacturing allows us to do this on a much broader scale." 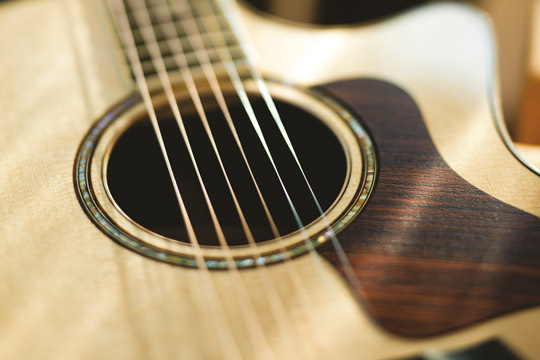 Both Bob Taylor and Andy Powers agree that the new guitars speak to the broader variety of music being played on acoustic guitar in the modern era. "These days you have everything from someone fronting a pop band with a highly processed electric signal to a jazz player to a fingerstyle player to a folk player playing in front of a microphone or just unamplified in a big room," Powers elaborates. "It's everything. Over the last 100 years the guitar has become the people's instrument. So, we're considering all those musical demands that players place on a modern guitar, we're reaching back and borrowing the great ideas and elements from old instruments, we're mixing in our fresh new ideas, and we're rolling all of this into these guitars. These are a snapshot of the very best that we're able to do." 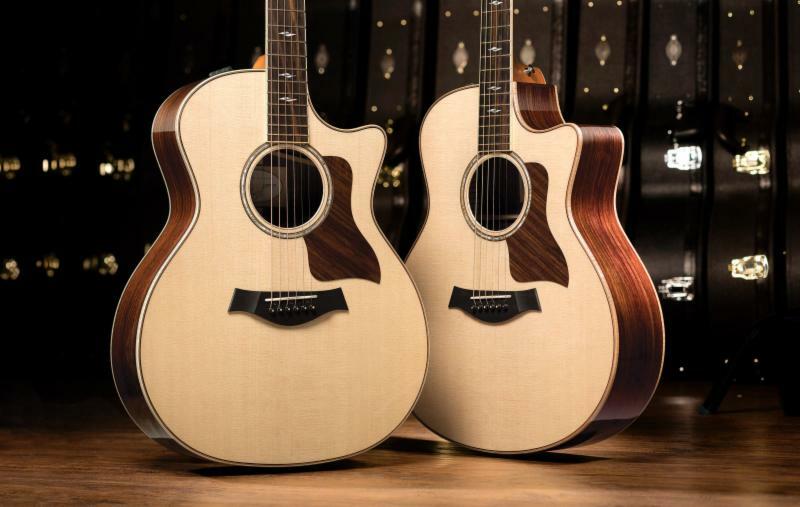 To experience the new 800 Series, and a variety of on-stage performances from Taylor artists, please visit the Taylor Guitars room located on the second floor of the Anaheim Convention Center, Room 213ABC.